Hobbit mania erupted in New Zealand's capital for the world premiere of Peter Jackson's new trilogy. The first of the three movies - prequels to the Lord of the Rings trilogy - was shown at Wellington's Embassy Theater on Wednesday evening. 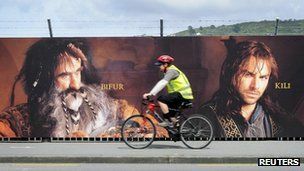 Stars flew in for the event, which saw Wellington rebranded as "the Middle of Middle Earth".